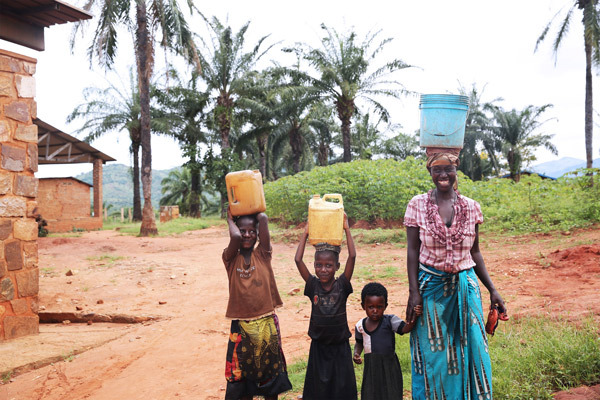 A family in Burundi, East Africa, after gathering water. Burundi is in the midst of a water crisis. Global entertainer and humanitarian, Beyoncé has teamed up with UNICEF through her BeyGOOD philanthropic arm to announce the launch of BEYGOOD4BURUNDI, a multi-year partnership to provide safe water to the most vulnerable children in Burundi, known as the "Heart of Africa." The partnership will support programs to improve water, sanitation and basic hygiene practices in the hardest-to-reach areas of the landlocked East African nation, where nearly half the population has no access to safe water. The water crisis in Burundi is a crisis for children. When children have to rely on unsafe water, they become weak, malnourished, and susceptible to water-borne diseases, which are among the leading causes of death in children under five. In order to walk for miles in search for wells, the lack of water also forces children to miss out on school. The burden of fetching water falls disproportionately on girls, who risk attacks along their journeys. "Access to water is a fundamental right. When you give children clean and safe water, you don't just give them life, you give them health, an education, and a brighter future. I am committed to helping drive lasting solutions to the water crisis in Burundi," Beyoncé said. "Addressing the global water crisis is one of the defining challenges of our time, and the children of Burundi are among the most vulnerable," Caryl M. Stern, President and CEO of UNICEF USA, said. "This unique partnership combines UNICEF's decades of expertise in providing clean water to children in Burundi and around the world with the power and influence of the entertainment world to bring about social change. We are grateful to Beyoncé and BeyGOOD for joining forces with UNICEF, to highlight this critical issue to new audiences." "BEYGOOD4BURUNDI is a continuation of the work that Beyoncé, her family and Parkwood Entertainment are doing to address water crises around the world, including right here in the state of Louisiana and in Michigan," Ivy McGregor, ‎Director of Philanthropy and Corporate Relations at Parkwood Entertainment, who traveled to Burundi earlier this year, said. "In Burundi I saw myself, my sisters and my mother in the strength of the women and young sisters travelling miles to carry water for their families. Today young girls in the 'Heart of Africa' are given the gift of hope for a brighter tomorrow through our multi-year partnership with UNICEF and commitment to support safe water access solutions." The first phase of the partnership includes the construction of new wells equipped with hand pumps, hygiene education and the improvement of water and sanitation facilities in schools in four priority regions, including Bukemba and Giharo in Rutana Province and Kinyinya and Nyabitsinda in Ruyigui Province. In these rural communities, children are chronically malnourished and more than 65 percent of the population is using unsafe water sources. Children and families have to walk long distances to water collection points, and even then the water access rate is extremely low. More than 100 million people have gained access to water, sanitation and hygiene (WASH) services with the support of UNICEF in the last three years. With over 70 years of field-tested experience and a network that spans the globe, UNICEF has unequalled expertise in providing immediate, lifesaving relief as well as driving long-term, sustainable solutions to the biggest development challenges facing the world's children. June 30's announcement in New Orleans, at the Essence Music Festival, is supported by CHIME FOR CHANGE, the campaign co-founded by Beyoncé, Salma Hayek Pinault and Gucci in 2013 to address critical issues facing women and girls around the world, and Global Citizen, the global social action platform that aims to solve the world's biggest challenges. Global Citizen believes that it is only through partnership that the world can end extreme poverty by 2030. In 2015 CHIME FOR CHANGE and Global Citizen joined forces to achieve measurable outcomes for girls' and women's issues, leveraging the combination of their powerful platforms, communities, partners and influence. CHIME FOR CHANGE and Global Citizen support Beyoncé, BeyGOOD and UNICEF in opening an interactive experience at the Essence Music Festival that depicts life in a village in Burundi and the water crisis, complete with story-telling, photographs and moving images. The BeyGOOD4Burundi experience occupies booth #450 at the New Orleans Convention Center and offers festival goers simple ways to help. The experience was open through July 2. The United Nations Children's Fund (UNICEF) works in more than 190 countries and territories to put children first. UNICEF has helped save more children's lives than any other humanitarian organization, by providing health care and immunizations, clean water and sanitation, nutrition, education, emergency relief and more. UNICEF USA supports UNICEF's work through fundraising, advocacy and education in the United States. Together, we are working toward the day when no children die from preventable causes and every child has a safe and healthy childhood. For more information, visit unicefusa.org.